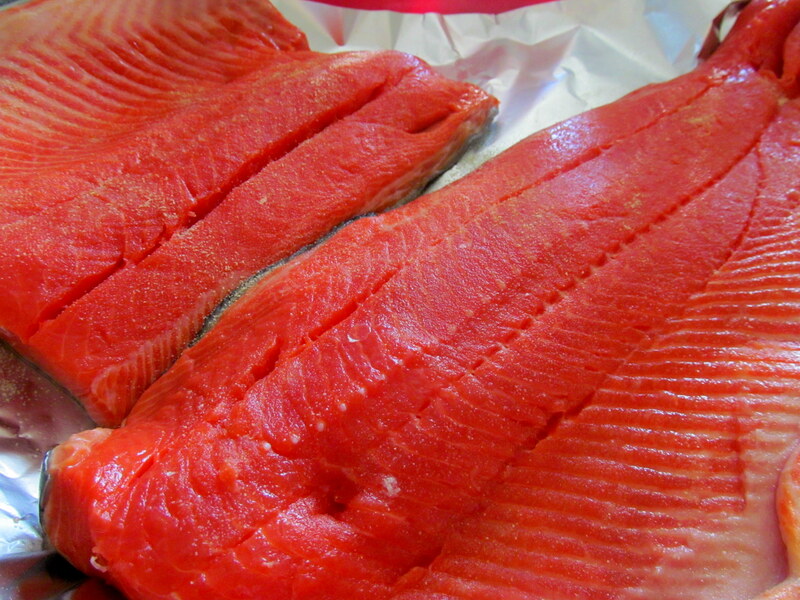 I received wild sockeye salmon from Whole Foods Market free of charge. This is not a compensated post and all opinions are my own. Firstly I must address the supportive comments and tweets I received in response to yesterday’s post. THANK YOU! It felt good to get it all off my chest and put my fears out in the open. After my post went up, Maria tweeted me a link to a Kris Carr article containing a nifty acronym…FEAR = False Evidence Appearing Real. LOVE that! Fear is so often based on what is false and I’m feeling totally inspired to keep the acronym in mind today and beyond. Let’s get on with today’s blogging! I worked with the three Hartford area Whole Foods stores (Glastonbury, West Hartford center, and Bishops Corner) previously during a one-day sale on shrimp. We teamed up again to promote the latest one-day sale, which took place last Friday 6/21 – wild sockeye salmon for just $11.99/lb! Now that’s a LOT of salmon! I brought the beautiful fish home to my mom, who had a great marinade recipe given to her by a friend. Combined with my dad’s skills with a grill, we had a Sunday family dinner feast on our hands. Gorgeous and fresh – even after grilling it a few days after I got it. Salmon on the sprayed foil, with ingredients, pre-marinade. Lay foil out on a cooking tray and spray with cooking spray before laying salmon down on top, pink side up. Sprinkle on garlic powder, pepper, Chef Paul seasoning. Drizzle with soy sauce and EVOO. Let sit out for 45 minutes. 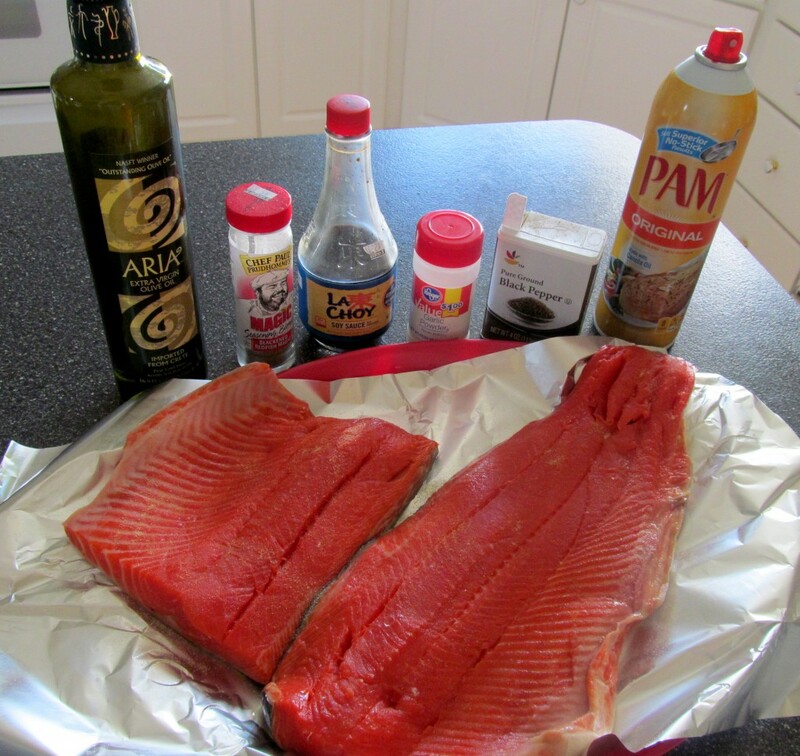 Periodically use a basting brush to reapply any marinade that drizzles off the salmon. Grill for 15-20 minutes (depending on how well done you want it). 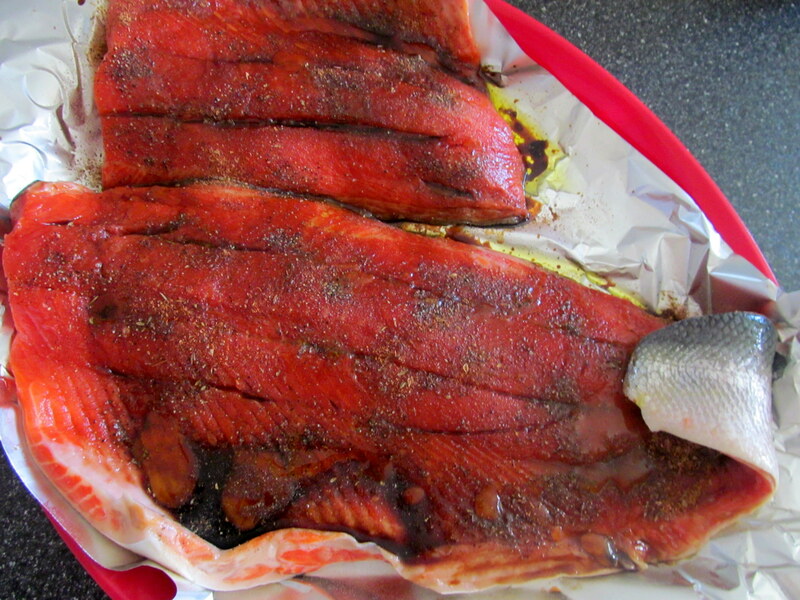 This is what the salmon looked like after the marinade was applied. My dad could not stop raving about how much the salmon was like filet – way to toot your own grilling horn, Padre. But seriously, we were all very impressed. One aspect of sockeye salmon that bothers me is finding the tiny bones in the fish, but my mom was nice enough to try to get most of them out before it was served. I chopped it up and put it in a big old salad. The salmon in my salad, and the entire grilled finished product! Last night a ten-minute storm knocked our power out for almost two hours – go figure – but the leftover salmon was perfect for a night when dinner would be served cold! I also packed the final remnants in today’s lunch salad, which I already can’t wait to dive into. 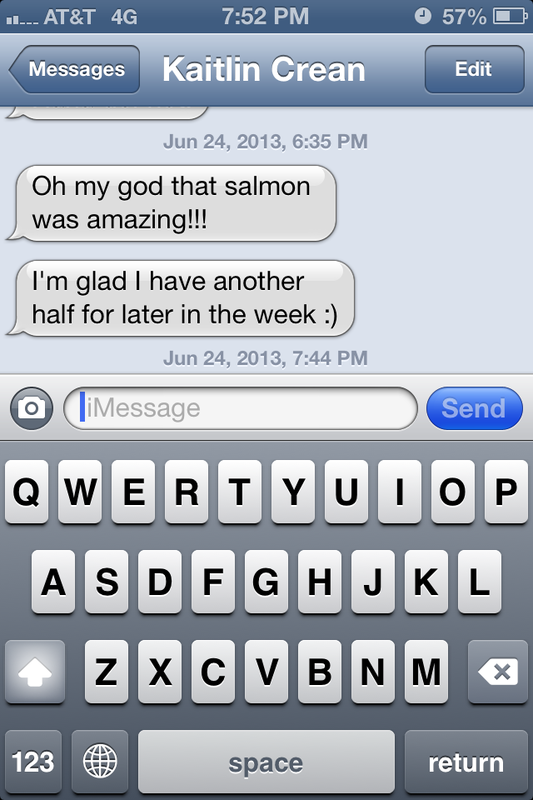 Five pounds of salmon ended up being too much fish for even my family, so I gave some to someone I knew would appreciate it – Kaitlin! And she was another satisfied customer. I love me some Whole Foods sales, especially when their fabulously fresh seafood is involved. My tastebuds are already itching for the next one! Thank you to Whole Foods for the salmon and the chance to share it with my family and friends! Do you ever take advantage of sales at Whole Foods?